The first step to finding a job you love is to first understand what is really important to you. We all think we know what’s important to us in our own minds. Financial reward and job satisfaction are often perceived as the priorities – however, there is so much more to this. Firstly, you have to really understand what your own values are and what’s essential for you in your next job or career. If your essential values are not met, you will never love your job. So what better place to start than here – identifying your own personal values. That way you can start building your whole job search around the Values that inspire and motivate you! I have been using a Values Exercise with my clients for years and the feedback I receive is always so positive. They really help my clients see clearly what’s really important to them and highlights values they had never considered before. It’s such a powerful and visual tool. So, I have now created a whole set of branded Values Cards for you to buy. There are 48 Values and 3 Header Cards (Essential, Fairly Important and Not Important) in each pack. Each card represents a tangible value such as ‘Challenge’ – I like to feel challenged or ‘Location’ – I want to be able to choose how near/far / where I work. The cards are postcard size and on the back you can write key messages or comments to help inspire you such as ‘I don’t want to commute for more than 1/2 an hour each way a day’. 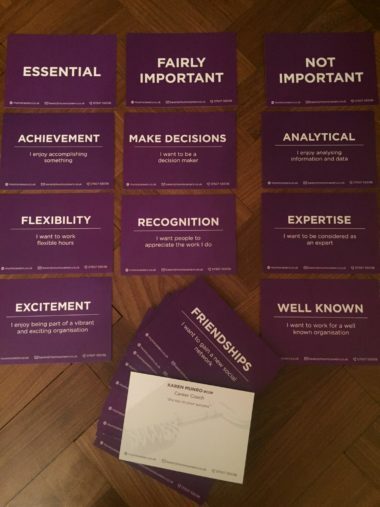 If you purchase a set of Values Cards, you will receive 10% off your first Career Coaching session. One pack will cost £15 (instead of £22.50) incl P&P in the U.K – while stocks last! If you would like to purchase a set please contact me through my ‘contact me‘ page with your details.